I hope that works. I will post here one photo only but will include a link to the imgur-album. We played Campo Santo yesterday night. I had the Spanish and my dear wife the Austrians and their allies. 1. GL Duc de Atriaco (Dep.) : 2 x Cuir., 1 x Drag. 4. MdC Gravina (Dep.) : 3 x inf. 6. MdC Torre (Dep.) : 2 x Drag. 6 FML Ciceri (Dep.) ? : 1 x Cuir., 1 x Drag. "I had the order to attack the Austrians, but noticed all the difficulties of that adventure. Therefore I contrated my army around the village Camposanto at the Panaro. I was surprised when my scouts informed me that the whole allied army was in full advance. 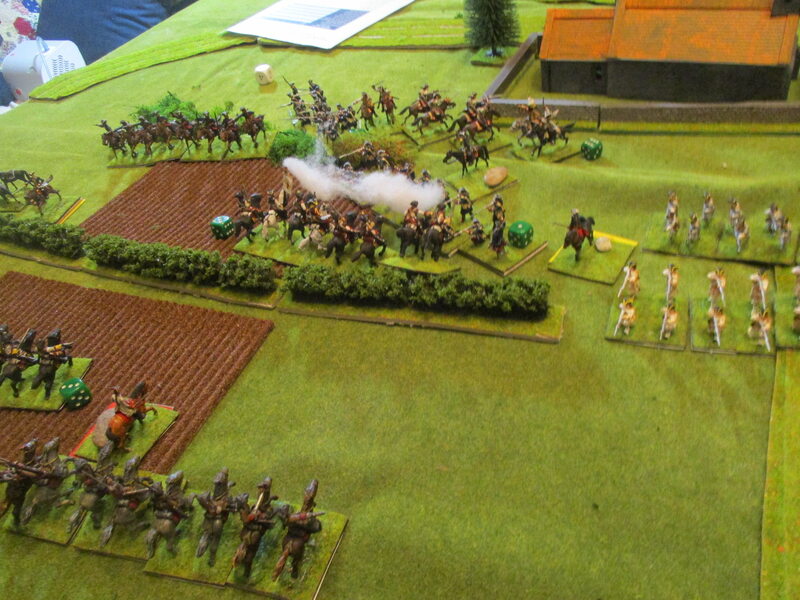 The duke of Atriaco send his cavalry forward to stop the masses of Austrian horse which tried to assault his flank. After one and a half hour the fighting became serious. The Allies came in range to fire their volleys and I decided pull back my first line under Ramirez and brought my second line forward. The Allied right wing never caused real problems for GL Mariani and MdC Torre. Their cavalry was to slow to charge successfully. 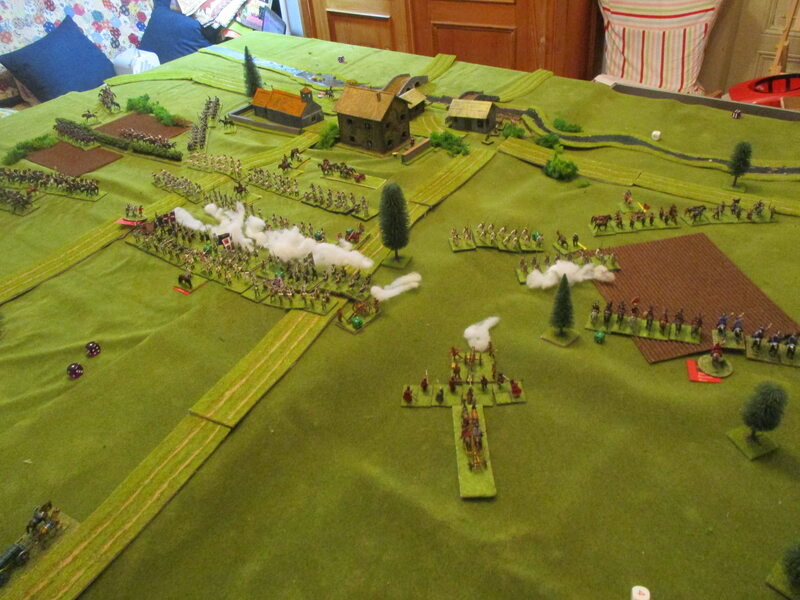 But at my right wing the Austrians charged with full swing, destroying one of our horseregiments. But their general failed to stop the victorious riders which followed my routed horsemen and the guards welcomed them with a devastating volley. Although one of our cavalry regiments had to retreat the guards and our dragoons at this wing could stop every further success of our enemies. At the center at this stage we were more successfull. Ramirez and Gravina defended their position. Sometimes they managed to shoot in the flank of the enemy. When the sun set the enemies lost some batallions. But 3 of our batallions in the center had to retreat too. At our right wing the Austrian artillery destroyed one of our finest units. But they could not advance with their cavalry. I have the honour to inform you that we defended our positions and the Austrians got a bloody nose. 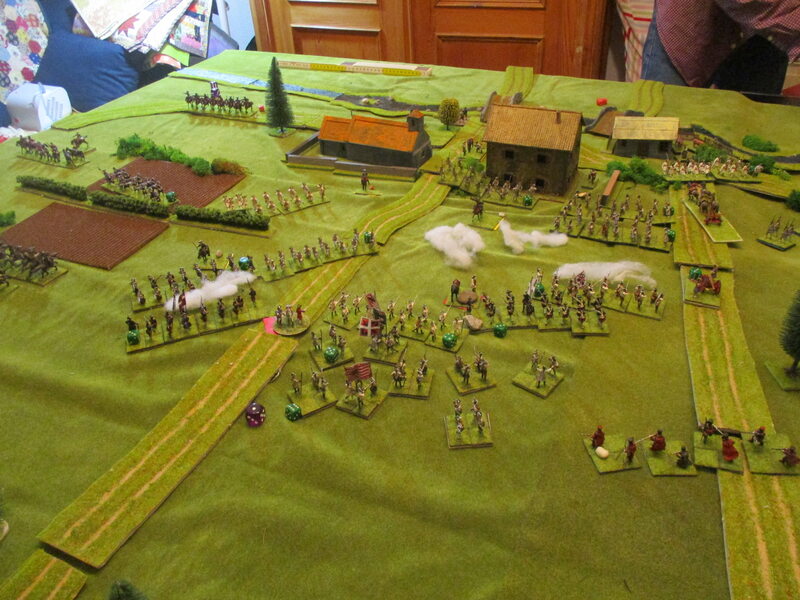 As a wargame it was a draw although the Spanish had fewer losses. But halve of their infantry in the center had to rally and the guards were the only troops who could still stop the enemy at the center. Very comprehensive narration of the battle! Nice pictures taken at crucial points! Must have been an enjoyable battle, we may give it a try! Did you looked in the link of the album? I think that Guastalla and Parma were a lot more interesting. But the battle is very balanced and perhaps perfect for a club night. Of course! Your table setup is always very nice, this green hue is very pleasing to the eye and offers a great contrast, especially with red-clad figures! Yes, Guastalla or Parma may look more interesting, but I'm sure we'll give Campo Santo a go soon! Cheers!